I have been to Rio de Janeiro twice and each time, I was surprised by the city’s beauty. The Portuguese settlers couldn’t have chosen a better location. In between the mountains, the bay and the sea, with islands dotted along the coast, a white city sprawls out so far, it is impossible to see its limits. Rio de Janeiro has its problems, with high crime rates and gangs winning back favelas. I had a long discussion with my Pantanal tour guide about whether or not you should call a city like Rio beautiful. In the end, we agreed that despite everything happening in the city, its location was stunning and it is worth a long visit. And this post isn’t about Brazil’s problems and politics. 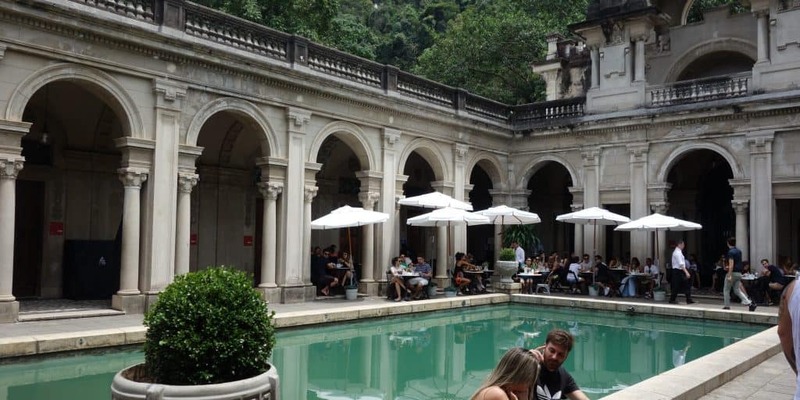 It is about how to enjoy Rio de Janeiro and to make the most out of your stay in one of my favourite cities in South America. 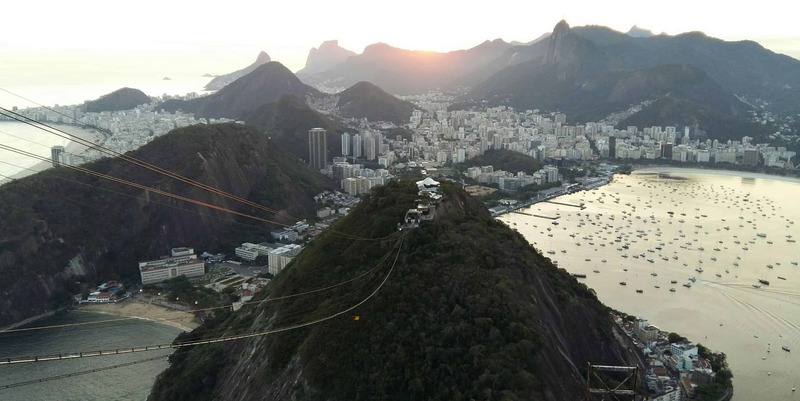 The statue of Christ and Sugarloaf Mountain are the two most accessible viewpoints in the city. The latter will always be my favourite place in Rio de Janeiro. To get up to Sugarloaf Mountain, you need to take a cable car that will first take you to Morro Urca and then up to the second peak. It is possible to walk up the first hill. 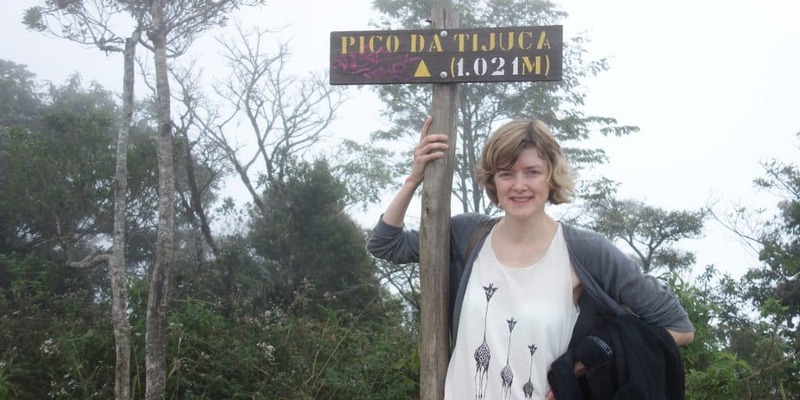 While you can also hike up Sugarloaf Mountain, you will need proper climbing gear and a guide. Both times I came to this place, I stayed for sunset. The second time, it was for my friend’s birthday. We packed snacks and had cake as we watched the sun disappear behind the mountains. It was a truly beautiful sight! There are no metro stations near Sugarloaf. You will have to go to Botafogo and catch a bus to Urca from there. The statue of Christ stands tall on a mountain called Corcovado. You can see it from almost everywhere in the city. To get close to it, you have two choices. You can either take one of the minibuses leaving from various places in the city or you can go up by funicular train. The latter departs from Cosme Velho and is more scenic, but there might be long queues. 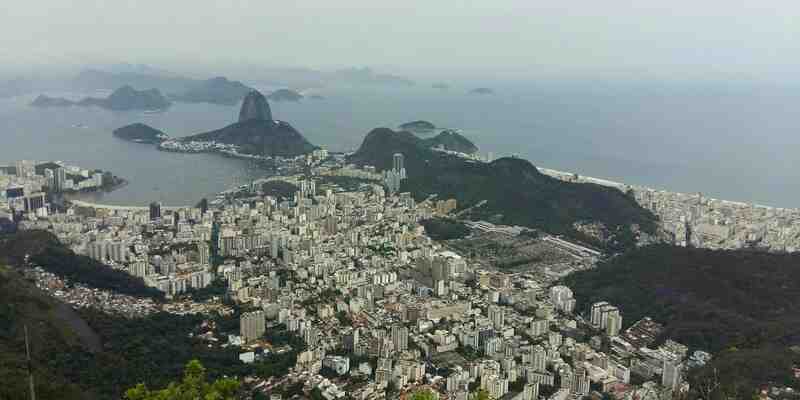 Personally, I find the view from Corcovado as stunning as from Sugarloaf Mountain. The reason why I would always prefer the latter is because the space around the statue of Christ is packed with people. Even in low season, it feels crowded. The spot is still stunning enough to make it worth braving the crowds. On the way back down, the funicular stops at a museum about the Tijuca Forest. I highly recommend you get off and take a look. Rio de Janeiro has a lot of beaches. 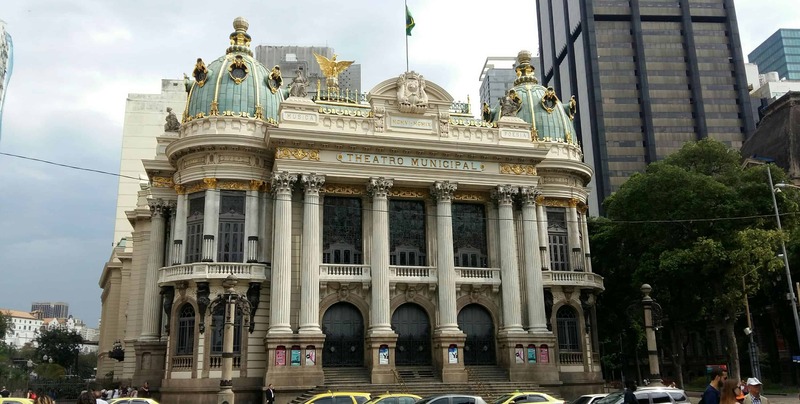 Copacabana and Ipanema might be the most famous ones, but there are many more all over the city. You can easily spend days exploring one beach after another. 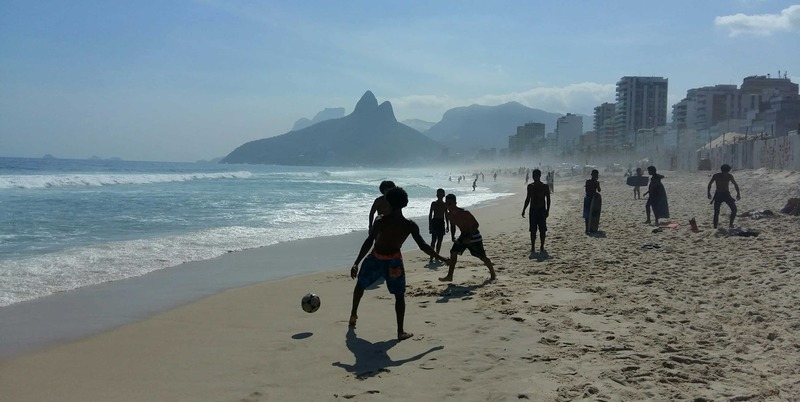 On most beaches and especially on Copacabana and Ipanema, you can rent chairs and umbrellas. Beach huts all along the way will supply you with food and drinks but it is more fun to buy snacks from one of the many vendors that pass by. Some even have small, portable grills that they will set up in front of you! Rio de Janeiro is huge. In the south, you have the beaches of Copacabana and Ipanema. In the north, you have more neighbourhoods stretching out. Each one of those places has their own centre, but Rio’s official city centre is located almost in its middle. This is where the city started and the best way to explore this area is with a free walking tour. That way, you’ll learn lots of interesting facts about Rio de Janeiro’s history and daily life in the city. Rio’s most famous fort is located on a tip of land in between Copacabana and Ipanema. Before the fort was built here in 1914, you could find a church in its place. The fort includes a museum as well as entry to the space underneath the cannons. But the real reason to come here are the stunning views of Copacabana. Rio de Janeiro’s Jardim Botânico, located in the southwest of the city, is a beautiful, large park where you can see more than 8000 kinds of plants – from Atlantic Forests to orchids, bromelias and paths lined with huge palm trees. You can also find a bamboo grove here. If you’re lucky, you might even run into one of the monkeys that can be found all over Southern Rio. Many favelas in Southern Rio de Janeiro have been pacified over the past years, with the police kicking out (most of) the drug-dealing gangs. Staying in a hostel in one of those favelas is a great way to experience those communities. We had a room in Tiki Hostel, located in the neighbourhood of Cantagalo, on a hill in between Copacabana and Ipanema. From the giant rooftop terrace, we could see both beaches. If you do not want to sleep in a favela, another way to experience them is on a guided tour. Never walk off on your own. And before booking a tour to Rocinha, Rio’s largest favela, do your research. As of October 2017, there is a war between the police and the gangs going on in Rocinha, which resulted in a Spanish tourist getting shot. On the other hand, don’t let those news scare you. There are many pacified favelas that are still safe to visit, as long as you use common sense. Tijuca National Park is located right in the middle of Rio. You will catch a glimpse of the forest on your way up to Christ the Redeemer, but the best way to experience it is on a guided hike. You can find hikes for all difficulty levels, from easy walks through the forest to exhausting hikes that take you up to stunning viewpoints. Covered in sweat, you will be graceful for the waterfalls that you can swim in at the end of your hike. And if you have your own car, you could also stop for lunch or dinner in one of the park’s restaurants. The National History Museum is located in an old colonial building east of the city centre. It covers a wide period of time, from before the first European settlers arrived to the present. 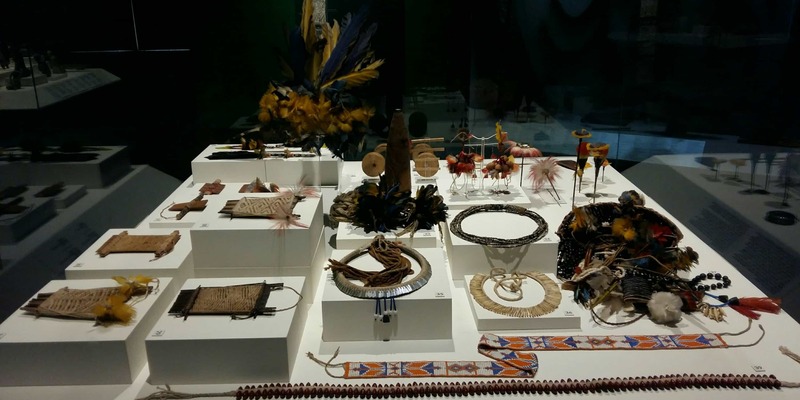 Exhibits are beautifully presented and almost all signs and explanations are written in both Portuguese and English. Don’t miss the lower floor where you can see an exhibitions about ancient cars. Starting at the Praia Vermelha in Urca and winding along in between the sea and Sugarloaf Mountain, this 5km-walk is a great way to experience the Atlantic Forest and spot marmosets. While those monkeys are not native to Rio de Janeiro, they have reproduced so much that they can now be found all over the city. The bottom of Sugarloaf Mountain is a great way to see them. The Pista Cláudio Coutinho is also where you start your hike up Morro Urca or, if you have a guide and special equipment, your climb up Sugarloaf Mountain. 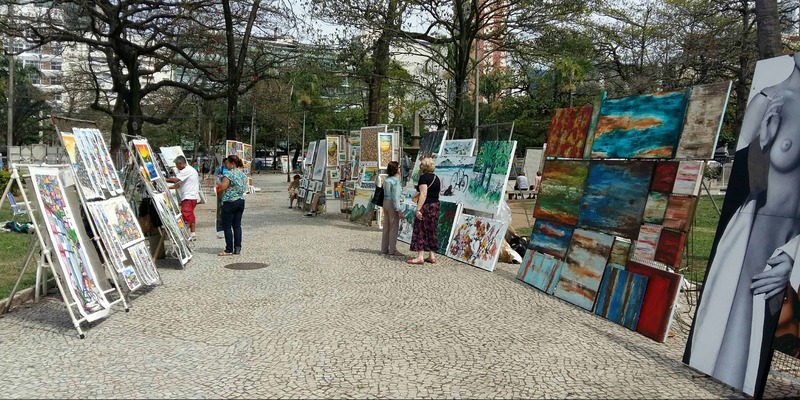 The Hippie Fair is a market that takes place every Sunday in Ipanema. Many artists sell their crafts here, from jewellery to paintings. If you’re looking for souvenirs, this is where you will find a wide range of things – so many that it will be hard to choose. The small rocky outlet, in between Copacabana and Ipanema, is, besides Sugarloaf Mountain, one of the city’s best sunset spots. Take a drink and sit down here, with the view of Ipanema Beach and the islands, and watch the sun go down. Parque Lage is one of my favourite places in the city. Located at the base of the Corcovado, it is an oasis of quiet in this otherwise busy city. The mansion with its pool is stunning to look at and one of the highlights is enjoying a drink in the cafe inside. Don’t miss the Princess tower and the caves, hidden somewhere in this park. Also, make sure to come during the week as the park can get very busy on weekends. 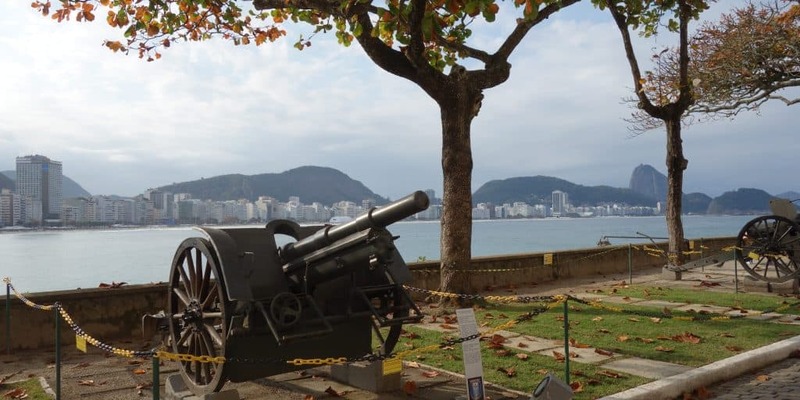 At the eastern end of Copacabana Beach, you can find this fort that is also known as the Forte do Leme. 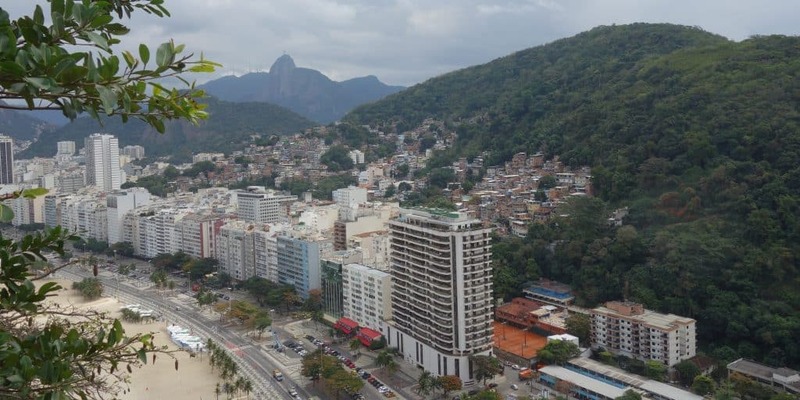 It is located on top of a hill and from up here, you have a great view of both Copacabana and Sugarloaf Mountain. When I went, I saw many marmosets along the path leading up as well as just outside the building. If you haven’t spotted any of these monkeys yet, this might be your chance. 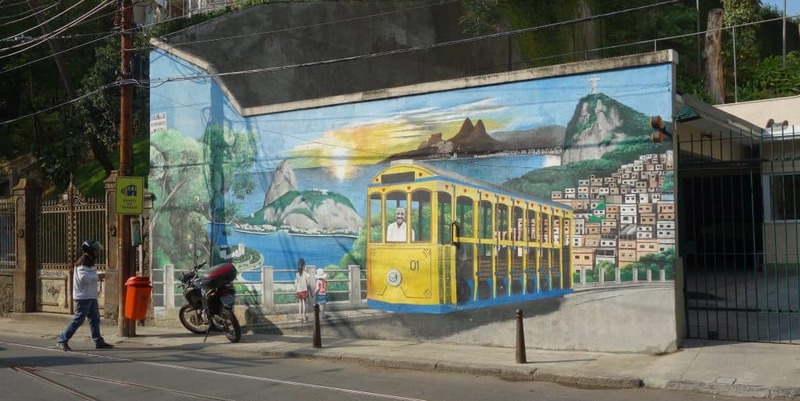 The bonde is a yellow streetcar that travels over the arches of Lapa into Santa Teresa. A bohemian district with lots of restaurants and bars, Santa Teresa is a great place for a night out. You can also find a museum and some nice viewpoints up here. Santa Teresa wasn’t my favourite part of the city, but it is definitely a good option if you have visited Rio’s main sights. Thank you, David! I read your Rio notes from your book and they were so interesting! Plus, I am a bit jealous that you went to Petropolis. We thought about doing a day trip there but we just didn’t have the time.